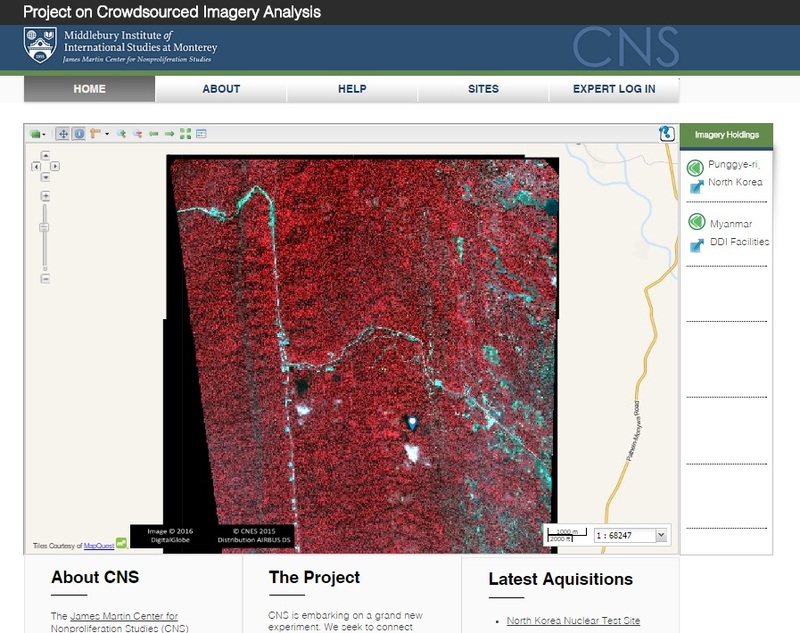 There’s a lot of hype about the use of both commercial satellite imagery and crowdsourcing for verification activities. Well, I decided to put those two hands together and build a website with Jeffrey and Catherine (it’s why you haven’t heard from me in forever). Welcome to www.geo4nonpro.org! The idea is to invite a “curated” crowd of experts who will annotate and comment on satellite imagery. We’ll roll out a new campaign each month and provide fresh batches of satellite imagery, you provide the opinions. So far we have North Korea’s Punggye-ri and some of Myanmar’s DDI facilities up. We’re also going to give you some new stuff. Depending on the site, we may offer layers of images from different dates, bands of non-visible light, or even address breaking news or an emerging crisis. We’re also going to be pressing hard on social media to hear what you want in terms of sites and imagery. We’re not made of money (NONprofit, remember? ), but we’ll try to get you what you want. Check us out on Twitter @geo4nonpro and use the hashtag #geo4nonpro to get our attention. So who is an “expert”? Well, we have quite a few of the usual suspects in terms of policy wonks, but we’re also soliciting rocket scientists, architects, hydrologists, and more. The public and press can watch the action unfold on the public facing website, or even apply to become an expert member themselves. Not sure if you’ll fit in? Apply and we’ll follow up with you. At the end of the year, we will compile results on who participated, how they were incentivized, and how they fared. We have an internal CNS red team that’s doing its own analysis on each site. We want to see if the crowd does better than the in-house experts. We’ll try to learn from our successes and failures, and lay out best practices and challenges for future imagery crowdsourcing efforts. This is a pilot and we hope to raise more funding to improve the user interface. If you’re feeling overwhelmed or frustrated with the site, reach out to us! We’re really friendly, and hardly ever bite. Is there (going to be) a way to grab the entire annotation dataset and the images in bulk? It would be a great application for machine learning research. We’ve thought about it. The images are licensed, but the shapefiles are very useful. I am sure Melissa and Catherine would be eager if someone wanted to do that. Email them! It is truly a GREAT idea. There are a lot of people with the skills but what value would the work be to Russia, China and particularly the NORKs. I’ve been blocked from distributed scientific work because I’m an encryption expert. Could be random, could be to stop me, and several other encryption experts from being allowed to join. Just how valuable IS that work? If I grabbed a complete data-set, what value would it have? It also gets access to you’re PC so if you are an expert in the field, how much more data could be scraped by Regin (or it’s Windows 10 brother)? I recommend you air-gap the PC you use for this work from all your computers with valuable data. Sorry to be paranoid, but if anyone knows just HOW potent these rootkits are will know it can take EVERYTHING. They even sit in you’re BIOS so even replacing the HD & swapping to Linux won’t stop it. Sorry for sounding like a conspiracy nut, but if the results are for a tightly limited audience, presume all data on every machine WILL be uploaded by the NSA, FFS & SSD… at the very least. Air-Gapping means that data goes IN, but not out – so no other security data EVER having existed on the HD. I found out the hard way – Regin Bricked my PC when I got too close. Distribute 1-time pads by post – it’s 100% secure.